Osocalis XO Brandy is a smooth, rare Brandy hand-crafted in a small, antique alembic still that is as refined, complex, and well made as the best France has to offer. Daniel Farber wandered the world working at various distilling houses, including a time in the Cognac region of France. He settled in the Santa Cruz area of northern California in the heart of wine country and set about tinkering with distilling local wines into Brandy. Jeff Emory is the winemaker behind Santa Cruz Mountain Vineyard. If there is one thing that you need to make great Brandy it is a steady supply of great wine. Daniel and Jeff partnered up. The result is Osocalis distillery where Daniel takes Jeff’s wine and blends it with other varietals in the region—focusing on Colombard and Pinot Noir—to distill their new twist on an old classic—California Brandy. They produce four different Brandies, three traditional and one from local apples. Osocalis XO Brandy is… well, an XO. What does XO mean? Glad you asked! Brandies and Cognacs have more acronyms after they names than a psychiatrist convention. In this case, XO means “extra old,” or—in Brandy parlance—it means it is at least eight years old. Something that Osocalis can do that their cousins in France can’t is blend grapes to craft a flavor profile. 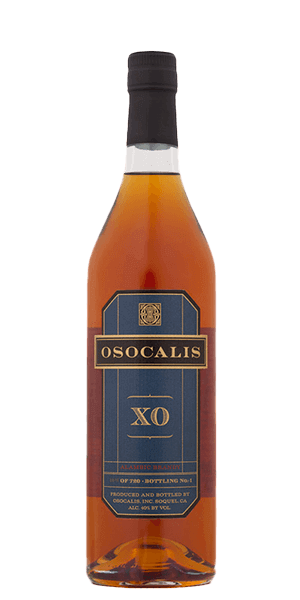 In this case, Osocalis XO Brandy is a blend of Colombard, Pinot Noir, Semillion, and Chenin Blanc Brandies, and some of those are more than a decade old. Magic. All you need to know is that this is a smooth, rare Brandy hand-crafted in a small, antique alembic still that only holds 100 gallons at a crack. It is well-aged and as refined, complex, and well made as the stuff made by Pierre France-y-pants, but he has his nose stuck up so high in the air he can’t even see the writing on the barrel. Sip it neat from a proper snifter and toast your good fortune. What does Osocalis XO Brandy taste like? The Flavor Spiral™ shows the most common flavors that you'll taste in Osocalis XO Brandy and gives you a chance to have a taste of it before actually tasting it. love it . smooth and potent .